When I arrived at the bus, the day was sunny and warm unlike the rest of the week. Everyone (when I say ‘Everyone’ I mean everyone) was excited and looking forward to snowball fights, tobogganing and just being with friends. No matter who you looked at every single person was smiling, grinning or laughing. The bus trip looked like it was going to be fun the entire way to Jindabyne. The TV screen on the bus went on and everyone fell quiet, craning their necks to see the movie. The movie was turned off as the bus pulled into Cooma. Cooma’s lights danced outside the windows. The bus stopped outside McDonald’s. I got up and followed the crush of scouts out of the bus, through the car park and to the entrance of McDonald’s. The line of kids was so long that it took up the two ordering counters and the collecting counter before curving around half the shop, snaking around to the door and going outside to the car park. So there I was, standing outside in the cold night air with my friends watching other kids eating hot food inside the warm restaurant. After what seemed like an eternity we finally made it inside. Once we were waiting inside, the line seemed to go faster. Locals looked startled at the amount of kids and staff tried to manoeuvre around us all. When I reached the front of the line I ordered and went to the collection line. I got my food and went to find a table. Every table was full. After I while a found a spot and sat down. I ate and before I knew it, we were on the way to Jindabyne. It was cold when we got off the bus. We got our bags and took them inside. Inside Jindabyne Scout Alpine Centre it was warm. Compared to outside it was wonderful. We found our way to our beds and quickly set up. We put on our sheets and unrolled our sleeping bags. Then we went and helped anyone who needed it. When we were finished we went to the hall to talk about what was going to happen. We either stayed and talked with friends in the hall or went back to our beds. I was back at my room when I met one of my old friends. I had been good friends with Naomi when I was a kid but her family had moved away. I never thought I would see Naomi again, but here she was. I didn’t even realise she was in Birralee’s other Scout troop! I also met some people from school and sports that I already knew and were good friends with. Soon, a leader came and told us it was time to go to bed. The first night was like any other scout camp. Kids were talking and giggling, other kids were telling them to stop and others were snoring so loudly you would have thought they would wake the dead. But eventually everyone fell asleep. The next morning I woke up at about 6:30. All around other kids were waking up too. The lights were turned on and everybody got dressed. We went and had breakfast and then packed to go to Perisher. I got on the bus and found a friend to sit with. As we drove to Perisher, everyone was looking outside, hoping to get the first glimpse of snow. The first snow that we saw was just cold patches on the ground. Every 100 meters there would be another patch of snow. The further we went the more snow there was. The distance between snow patches became less and less until the ground had an unbroken covering of cold white snow. The bus kept driving until we had reached the parking lot at Perisher. Here everything was covered in snow and ice. The buildings had snow on their roofs and towering mountains were clothed in snow from base to peak. We got off the bus and put on our beanies and gloves and zipped up our jackets. We picked up some gear and followed the line of scouts towards a flat plain of snow. The gear was sorted and given to cubs, scouts or venturers. Then we separated and went off to our activities. My first activity was shelter building. We were going to make igloos big enough to fit our patrols in. We were given snow saws to cut ice blocks to put our shelters together. We made our outline then cut out the centre of the floor. The walls were hard to build. The first layer of snow had to be scraped off, then someone had to saw the block and another person had to carry the block to the wall and find a spot to put it in. Next snow had to be packed into the gaps around the block so the wall didn’t fall down. It was hard work but when lunch was called we had built a wall about a meter tall. Inside the igloo we had cut the floor so it resembled a circular chair. The top wasn’t quite finished but as least the wall stayed up unlike some other shelters. At lunch time everyone met back together for homemade hot minestrone soup or chicken noodle soup. I found out the venturers had been tobogganing and the cubs snow shoeing. After lunch we went tobogganing. Everyone had to trudge up the hill to the top of the slope then line up. The slope was so steep that you had no control of the toboggan whatsoever. Watching everyone go down didn’t help with the nervousness as half of everyone going down the slope fell off their toboggans. When it was my turn I just jumped on and hoped I didn’t fall off. It was a strange sort of fun. It was fun with scariness on the side, but that scariness was what made it so different from normal fun. After my first go I went to the smaller slope and started racing down the slope with friends. We raced over and over every time a different person won the race. Tobogganing is fun but tobogganing with friends was awesome. Tobogganing had finished and snowballs were flying everywhere. We were having a massive snowball fight with the igloos. 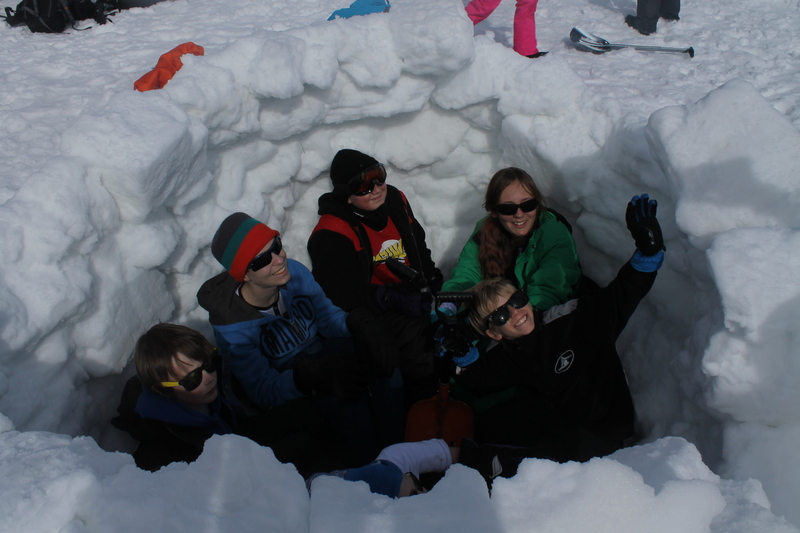 It was scouts VS venturers, who by the way had finished our igloo after lunch, completely closing it over. After a dinner of lasagne, chicken, chips and vegies, I joined the group in a big parade that was so big we had to be outside because the hall wasn’t big enough. The leaders presented Matthew Court, one of the Ventueres, with his Queen Scout Award. After this the cubs & scouts played a few games outside before retiring to bed. This time everyone was asleep quickly and it was morning before I knew it. On Sunday the weather was not so nice at Jindabyne. It was raining and very cold but up on the snow fields it was snowing. This time the bus took us to Smiggin’s Hole instead of going onto Perisher. The cubs went tobogganing, the Scouts went for a snow shoe walk and the Ventuers went cross country skiing. It was snowing the whole time until I got back on the bus when it turned to rain. The bus took us back to Jindabyne where I had lunch and then we all got back on the bus to head back to our families waiting for us at the Scout Hall. I couldn’t wait to tell mum how awesome the weekend had been. I hope we have another Group snow camp. 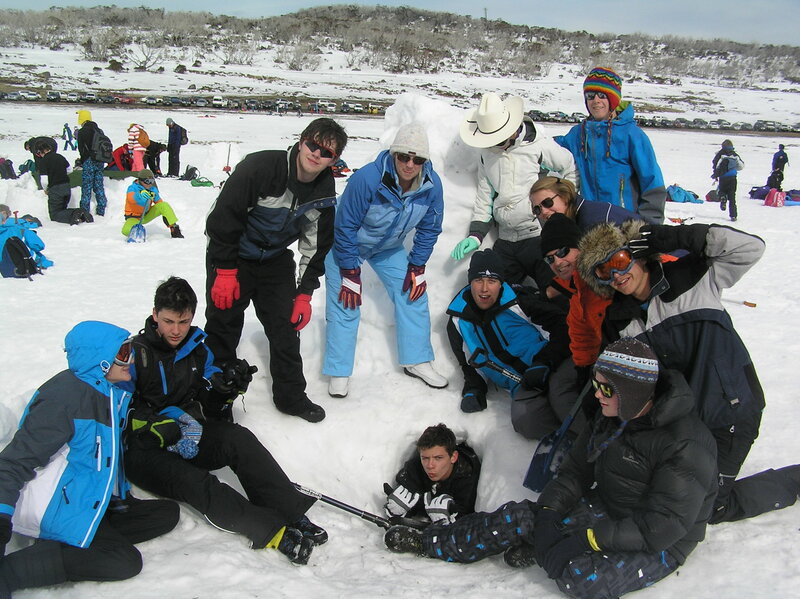 On Friday the 15th of August 90 odd cubs, scouts and venturers set off to visit Jindabyne for a weekend at the snow. On Friday night we really just stayed on the bus and talked but for dinner we stopped at McDonald’s Cooma and we spent nearly an hour in McDonald’s. On Saturday the 16th of August we woke up at about 7:00am then we got dressed, packed our day bags and hopped on the bus at about 9:00am. We had an hour drive up to Perisher where we stayed at the snow all day. When we got there we helped unpack the toboggans and snow shoes then we walked over to the area we were playing in. 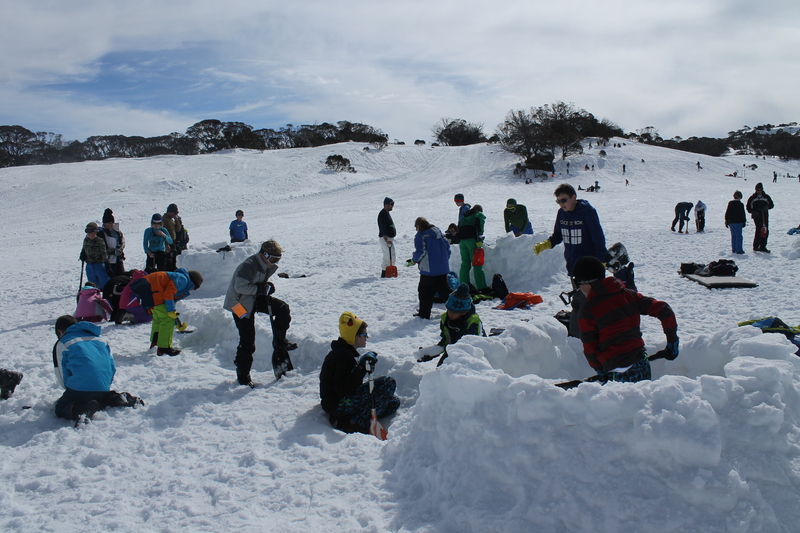 First the scouts were building snow shelters, the cubs were playing and snow shoe walking and the venturers were tobogganing. Then at lunch time the kitchen staff came up to the snow with a stove and food. For lunch we had soup and a piece of bread. After that the scouts were tobogganing, the venturers were snow shoe walking and the cubs went back to the lodge where we were staying. Although I stacked quite a few times I really enjoyed tobogganing because it was really fun going down a big hill at top speed. After a while when we all knew how to control the toboggans we started having races and I won about 6 of them. I also really enjoyed making snow shelters because I got to hide in my patrol’s snow shelter and throw snowballs at people. At the end of the day the scouts had a snowball fight against the venturers then we left for another hour ride back to the lodge. I didn’t really enjoy the snowball fight that much because one of the scouts, Michael, put a big cold icy snowball down my back and the venturers took over our snow shelters and destroyed them. On Sunday the 17th of August we woke up, had breakfast, packed our day bags and left to go to Smiggins Hole because the road was too icy for us to go to Perisher. When we arrived at Smiggins Holes we realised it was snowing on us! It was only snowing a little bit but after a while it got really cold. First up the scouts got to go snowshoe walking, the cubs went tobogganing and the venturers went cross-country skiing. When we were snow shoe walking I kept tripping but luckily my brother helped me get up and put my shoes back on. After that we all got back on the bus and went back to the lodge to get in clean dry clothes, have lunch and go home. I really liked the second day because it snowed on us which was really cool. On the way home we watched the end of “The Princess Bride” and after that watched “Garfield”. Halfway home we stopped for a rest in a park near Cooma, we stayed there for about ¾ of an hour then we got back on the bus and went home. When we finally got home we all went in the scout hall while we were waiting for our parents because it was raining. In the scout hall there was leftover food from snow camp that we could take home so I took some green cordial and some custard. There was also lost property for anyone who was missing anything. I looked in the lost property for my sunglasses but I couldn’t find them and I still haven’t found them so hopefully I will get some new sunglasses soon. At the end of this weekend I was sad to leave the snow but I knew it had been one of the best experiences of my life to go to the snow with my family and the scouts. This entry was posted in Group Activities. Bookmark the permalink.